Blogs, News, and Events / Blogs / Mobile Learning Consulting Webinar: Answers to Your Questions! 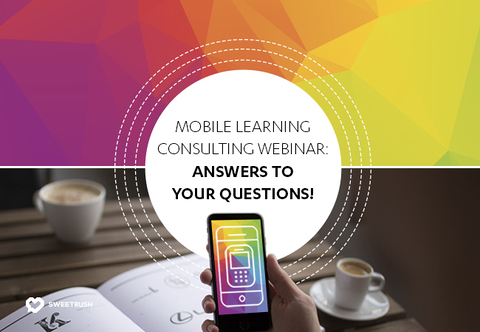 Mobile Learning Consulting Webinar: Answers to Your Questions! We recently held a webinar about mobile learning consulting, and we received some great questions from the participants regarding our mobile learning experience. To answer your questions, we reached out to the experts! Director of Engineering and Technology Misha Milshtein, QA Manager Susan Gravel, Solution Architect Erin Krebs, and our speakers, Manager of Instructional Design Clare Dygert and Senior Instructional Designer Shauna Vaughan, provided valuable insights and tips. If you’d like to stay informed about our upcoming webinars, we invite you to follow us on LinkedIn! What development tool(s) do you use for parallel development between the laptop, tablet, and phone? Misha Milshtein: We use a mix of the industry-standard tools (including Articulate® Storyline and Adobe® Captivate®) and proprietary coding frameworks depending on the project need and the client need. The current spread is about 70/30 in favor of standard tools. The selection of the tool depends on many variables, and some of the important ones are the features and functionality desired, the quality of the tool’s output to the desired formats, and whether the client desires to maintain (i.e., update) the solution in house moving forward. Deploying on phones is often not the main priority and more of a “just in case.” So again, we would take that into consideration when choosing the tool. When there is a true need for compatibility with phones, we’ve used such frameworks as PhoneGap™ for a phone-based app and Adapt framework for e-learning needs. Authoring tool vs. HTML5 for creation: what’s more typical? Misha Milshtein: In our experience, authoring tools are in much heavier demand. SweetRush also heavily relies on our own authoring frameworks, which provide us flexibility as well as development efficiencies. To what extent do you test your mobile learning on different devices? Can you talk about your testing once a course is built? Misha Milshtein: We employ both internal and external testing. This means that in most cases, the mobile product is being tested by team members on multiple devices, then sent to an outside contractor for proper independent testing. Susan Gravel: Specifications are defined up front as to what the client’s preference is. If no preference is indicated, then testing would occur on the latest devices. A stringent set of test cases are run on each device and if issues occur, the issue is documented, along with a screenshot, which makes it easy for our dev team to identify and fix. When it comes to troubleshooting an issue with an individual’s device, how far do you go with this—especially if individuals might not work for your company? Misha Milshtein: In the best case scenario, someone on the team can reproduce the issue. Once it is reproduced, in most cases it can be fixed. If we cannot reproduce the issue, we will try to get in contact with the person(s) who reported the defect. If we can at least see the problem on someone’s screen, it is easier for us to establish patterns and catch the culprit. Unfortunately, we might find out that we are dealing with a “known issue” in the authoring tool, and the issue cannot be fixed until the next update of the tool. In such cases, we might need to look for workarounds or alternative techniques. What are some ways to incorporate mobile learning into the work environment (e.g., utilizing the mobile medium and portability to create a dynamic learning environment)? Shauna Vaughan: Just-in-time performance support is a perfect way to incorporate learning into the work environment. For example, let’s say a factory worker needs to troubleshoot a piece of equipment. Using a phone or tablet, he or she could quickly access information to do so. (Using augmented reality, the worker could use his or her device to “hover” over the equipment and see the same information visually.) My husband, a paramedic, keeps reference guides (apps) on his phone and uses them at the point of need. Keep in mind that incorporating mobile learning into the workplace as a new mode of learning will require some change management and communication planning. How long does it take to create a mobile solution? Tablet-based learning using Articulate Storyline – start to finish is similar to typical e-learning timelines. Anywhere from 8–16 weeks based on level of complexity, engagement, multimedia elements, etc. The important note here is that when using a tool like Storyline, there is no additional time for developing a course for mobile vs. PC. Depending on which devices you are targeting, you might want to add a week to the timeline for additional QA testing and revisions. Tablet-based apps or phone apps – app development is typically a bit longer than e-learning. We often run app development in tandem with the learning components that will be delivered via the app. For app development, assume anywhere from 16–20 weeks. Phone only – there are many options for delivering mobile-phone learning, including authoring tools. We often use Adapt as a tool for building learning for phones, and timelines are similar to e-learning, 8–12 weeks. Because phones have smaller screens and less complex interactivity features, graphics can be simpler, reducing seat time. On the other hand, if you’re developing a game for mobile phones or complex 3D animations, time would be longer than a typical e-learning. It’s like building a house: depending on the type of house you’re building, it will take less or more time. However, these examples should give you a good starting point. Why is a second version of each course required for phone learning? Misha Milshtein: Phones, tablets, and desktop PCs are all different devices for a reason. They serve different purposes and are not fully interchangeable. It is only natural to expect that the content created for and distributed on those devices might need to be tailored for each type. Shauna Vaughan: The user experience for each device varies. For example, people expect to sit at a computer or laptop so they are accustomed to (but don’t necessarily enjoy!) longer courses on that device. Tablets are often used in lieu of laptops as a more portable option, so the experience on tablets is similar to PCs (so is the screen real estate). Phones are very different; people use them in a quicker and more purposeful way, and the screen real estate is much smaller. Therefore, the content design needs to be adjusted (e.g., smaller chunks) as well as the visual design. Erin makes an analogy that I like. People have been doing their taxes using computer software for years. And now there are apps for doing your taxes on your phone. Imagine if they took that computer software and just put it on a phone, with no consideration for the screen size and how you use the phone. You would be constantly expanding and shrinking the size, trying to put your finger in little boxes to enter the numbers. Sounds pretty unpleasant and clunky, right? This is why we need to consider and optimize for delivery on mobile devices. Clare Dygert: Another thing to consider is that the phones might have additional capability that desktops don’t include, such as GPS enablement, that could be used in the learning solution. Is there any significant difference for instance with an iPad® and iPad mini™? Misha Milshtein: There is not a significant difference. What types of content are companies using m-learning for (i.e. systems, soft skills, etc.)? Erin Krebs: We represent clients from a variety of industries (hospitality, retail, healthcare, banking and finance, automotive… the list goes on) and all of them are considering or already using m-learning for their training needs. They use it for anything from soft-skills training around communications and community organizing to tips for selling tires. What’s most important to consider is the desired learning outcomes and business objectives, and then looking at which delivery channels will be most effective in meeting those outcomes and objectives. Shauna Vaughan: The type of content is less relevant than the context of the content and how it is expected that it will be applied. Clare Dygert: I agree with Shauna: it’s all about the context when it comes to mobile. I’m interested in your thoughts on how to convey complex learning processes on smartphones—for example, how to deal with teaching higher levels of a foreign language? It seems to me that the material is too complex for the screen size. Shauna Vaughan: Remember that you are not bound to the technology for teaching. Consulting with the client might determine that the content is too complex or robust (or whatever) for a phone or other device. Heck, technology may not be the answer at all! And, with phones (and tablets), you aren’t bound to just presenting and teaching on the screen in the same way you are with a laptop or desktop. Use the camera for Facetime® or Skype™, use GPS, etc. There are LOTS of features and functions to incorporate into your content and learning solution. Clare Dygert: Consider breaking it into its subprocesses using a visual infographic. Also, use the context—where the learner is located. I’m not a kid, but I use my iPhone® for EVERYthing these days—including going to non-mobile, enhanced websites. I’ve learned how to enlarge parts of the page, etc. It’s not optimal, but it’s what people actually do. Thank you again for attending and we look forward to seeing you at our next event! Remember to follow us on Linkedin to hear about upcoming events.